Are we witnessing the slow death by commercialization of the Día de los Muertos tradition? Each year, with the ever-growing tidal wave onslaught of events, art exhibitions and celebrations sponsored by corporate interests who are only keen on marketing products that are at best unharmful and at worst, far from benign, I have to ask myself. Día de los Muertos in L.A., as an expression of creative energy wrapped in the rebozo of our spiritual ancestry and our indigenous roots, was first celebrated by artists and community folks who came together at Self Help Graphics 41 years ago. Back then, being Mexican or Chicano was still a thing to be disdained by the same hipsters and trendy culture vultures who go out of their way these days to paint their faces with the unmistakable calavera mask and go on any one of many Day of the Dead party crawls come the 1st and 2nd of November. In the interest of full disclosure, I didn’t become aware of Día de Los Muertos until I was in high school. It was the early '80s, and I was in Austin, Texas when Sylvia Orozco, a south Texas Chicana artist and her then partner, a Mexico City-bred painter and muralist named Pío Pulido, rolled into town and set up shop as Mexic-Arte. Obviously influenced by both what had been happening in LA and Pulido’s close connection to the actual tradition as observed in places such as Oaxaca and Puebla, they recruited me to organize, cast, co-write, act in and help direct a short Día de Los Muertos farce, a staged comedy that involved a pair of star crossed lovers and a politician. That year, I learned about José Guadalupe Posada, the legendary Mexican printmaker who pioneered the skeleton images and the tradition of limerick rhymes poking fun at contemporary political and social figures. At the same time, I was witness to the explosion in local Chicano art and learning first-hand how to hang exhibitions, in this case, of art inspired by the Día de Los Muertos tradition. Coming to LA in 2000, I had already even attended more indigenous, grass-roots Día de Los Muertos observations that excluded art and painted faces entirely. These were serious, all-night vigils filled with songs and prayers and candles that were meant to accompany our departed loved ones on the journey back from the underworld. We burned copal and shared cups of hot chocolate and sweetbread as others formed sacred indigenous Aztec symbols with flowers of different colors on the ground. Later, these flowers would be lifted and tied to long dowels or rods and these flower encrusted rods would be rubbed over our bodies in a ceremony of symbolic purification and rebirth at sunrise. So you’ll understand if I’m a little soured on alcohol-fueled Día de Los Muertos-lite. I have nothing against arts organizations truly rooted in community work or neighborhood activist and advocacy organizations honoring the tradition with expressions of art, the sales of artisan created Día de Los Muertos merchandise. This is a good thing. But I have to draw the line somewhere, and if you were not raised with the Día de Los Muertos tradition or only come to the East Side this time of the year to get your drink on and get your face painted then I don’t have any use for you. You’re not doing this community any favors just because you hopped on the Gold Line or rode a bicycle from North Hollywood and dropped your donation at the door. 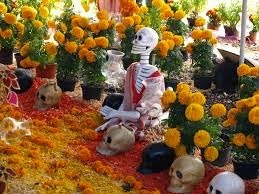 Mindful people would make it a point to remember that Day of the Dead, as originally expressed, was about reverence, about remembering our kith and kin on the one day out of the year they are allowed a visit to the earthly environs. It is all well fine and good to support deserving organizations, particularly those that are about empowering the least of us through arts education and cultural programming. And yes Brooklyn & Boyle has signed on as a sponsor for at least one Day of the Dead art party where Red Bull has left a heavy imprint. Check the inside back cover of the new print edition, if you must know. But that still does not and should not impede the serious considerations proffered in this editorial, written in a sacred city where ancient sorcerers once trained, in the mountains about two hours southwest of Mexico City. Here, the church bells ring all day long and the tombs are, even now, being decorated with cempasuchil (marigolds) and papel picado. We don’t want Walt Disney to own a piece of our spiritual past, present or future. You make that possible when you forget that it is not just another day like Halloween, but rather, a blend of our Catholic and indigenous belief systems developed to honor both traditions equally. Please regard it with the seriousness it deserves. It’s not a party and it never was.